1st Place tie: Toby Thompson (Trophy winner) and Nathan Girnius with 4 points each. 2nd Place: Joshua Iosevich with 2.5 points. 3rd Place: Dale Janezic with 1.5 points. Toby Thompson (front, with trophy) tied for 1st place with Nathan Girnius today at the Rochester Chess Center Kids tournament. From left to right: Dale Janezic, Evan Peterson and Harry Larson. 8th Geneva Scholastic @ North Street School, 400 W. North St, Geneva, 14456 9am, individual and team K-2, 3-5, 6-8 $10 entry. Call 585-442-2430. Round 2: Doug Spencer (left) drew Jacob Chen in a rook-knight-king vs rook-king ending in serious time pressure. Wed. Feb. 5th: The Rochester Chess Center is open tonight for the Community Chess Club of Rochester's chess games. Please drive carefully and give yourself plenty of extra time if you plan on attending the games tonight. We had a great turn-out tonight considering how much snow has fallen today. We had 11 players! 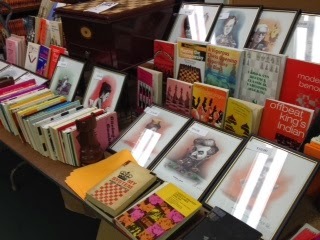 The Rochester Chess Center just restocked their old used books. There are some great titles. Check them out at the chess center, because they are selling fast. ** Update at 2:45pm Feb. 5th: Phil Smith at the USCF informed me that the USCF web server experienced a catastrophic failure, and the system had to be restored from backups. There still may be some permissions issues which are being investigated. The TD/Affiliate area is now working, and all pending USCF memberships have been processed. The Wed. CCCR and Sat. Chess Center results have also been processed. The FIDE results and SLWC weekend tournaments will be rated shortly. ** Update at 1:15pm Feb. 4th: The main web site (uschess.org) is working, but the chess club affiliate area is still down... still cannot process any tournaments/memberships.